National Park Service photo by Fred Mang, Jr.
Fort Union, a bustling center of frontier defense between 1851 and 1891, was one of the most important in a string of forts established in New Mexico and southern Arizona. Originally built to protect the Santa Fe Trail, the fort was the largest U.S. Army post and supply depot in the Southwest. It also provided a base for campaigns against the Apaches, Utes, Navajos, Kiowas and Comanches. The fort was abandoned in 1891. Today an impressive array of building ruins are all that remain of one of America's premier frontier outposts. 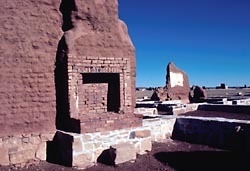 Administered by the National Park Service, Fort Union National Monument is eight miles north of Watrous, New Mexico, at the end of NM 161. A Visitors Center and museum relate the fort's history. A self-guided tour is available. Open daily from 8:00am to 5:00pm. Please call 505-425-8025 or visit the park's website for further information.